GREENPORT CONKLING PT CREEKFRONT MINT 3BR COTTAGE W/PRIME VIEWS - This cottage on a half-acre lot fronts on the pristine creek inside Conkling Point with one of the finest estuarine views in the Peconic Bay system. Facing southwest, it is bathed in soft light and summer breezes. The cottage was totally rebuilt for year-round use by one of the area's premiere restoration specialists between 1989 - 96 and update in 2016. On the first floor is a living room with two glass walls facing the creek and a see-thru fireplace to a dining room with sliding glass doors to the waterfront gardens. There is a nice country kitchen, 2-1/2 baths, 3 bedrooms (sleeps 8) and a shower bath with laundry. There is a first floor master bedroom with private bath and connecting screened-in porch with fine water views that are also enjoyed from bed. On the second floor are two bedrooms and a half bath. There is a dock and an attached two-car garage. The creek offers access to Southold Bay for shallow draft boats and an exceptionally safe and tranquil opportunity for kids to learn about fishing and boating. 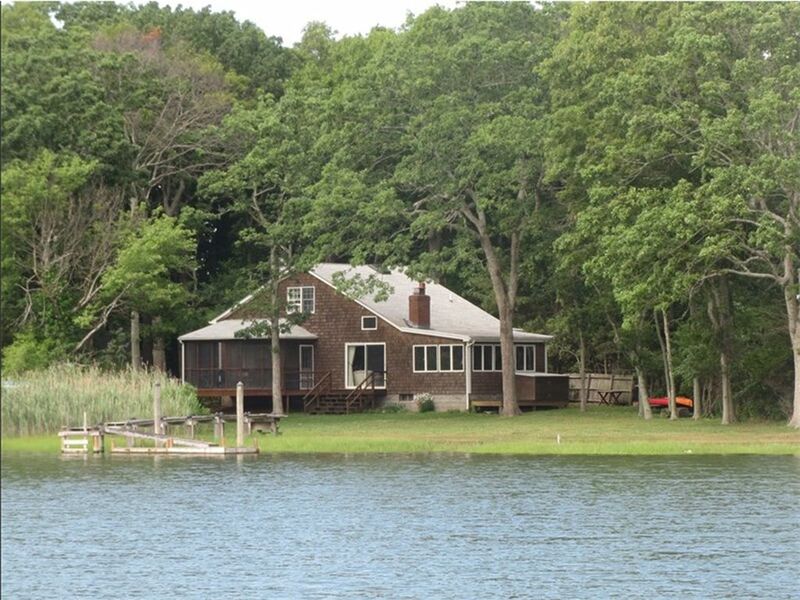 And for swimming, the property comes with rights to 200' of private beach on Peconic Bay. We are architects living in Brooklyn, NY. We purchased this as a weekend house in late 2015 as a place for our family to experience the natural beauty and connection to the North Fork's epic Peconic Bay. Amazing house on a quiet stretch of the North Fork. Perfect setting to spend Christmas with our family. Amazing view, chimney fires, walk on the beach and sound system! The house had everything we could hope for. Thanks to to our hosts for making us feel at home. We just returned home after visiting your wonderful home in Southhold. The house was great and provided us with everything we needed plus many extra's, canoes etc.Although only staying for a few days we managed to tour much of the North Fork.We also experienced a North Easter and were completely snug in your home.We hope to visit again perhaps during summer months when we can take more advantage of the water.It reminded me of Long Island as it was years passed.Would definitely recommend this rental. Our family had a great weekend enjoying this property and relaxing on the North fork. The property is gorgeous and the home has a wonderful layout! A long rainy 4 day weekend was not awash! Despite the weather not cooperating we still have a great time. The room with the library and the wonderful views of the water and shelter island made up for it. Soo cozy and wonderful. Then there was the dinning room table, every meal with a view that felt like a banquet! Our son loved the rec room and us adults LOVED the sound system. It was a wonderful time and we can not wait to visit again! A cozy idyll on the cove! A house whose space works well for adults and children. There is a sense of total privacy. The pictures do not lie. The views are magnificent. Whether sitting on the porch watching the sailboats or walking out on the spit of land that curves around in front of the house, you have a sense of peace. The home is fully equipped, welcoming and comfortable. Share laughter, meals and make use of all of the water sports equipment available. And just sit back and have fun. This was a great house for 3 couples to hang out at. Bedrooms are comfortable,and the house cozy. Kitchen, while small, is extremely well provisioned. Outside space is amazingWe especially enjoyed being right on the water, exploring the bay in the kayaks and on the SUPs. Outdoor shower was a big crowd pleaser. Location is also great for visiting vineyards and biking.